Mary and I watched this coyote feed on a winter-killed bison - the remains left by the Lamar Canyon wolves. Wolf scent must have been everywhere. Every 15 seconds or so the coyote would lift his head from eating and look around. When he finally walked away from the carcass, he stopped often to scan. Vigilance is the key to a coyote's survival. In Yellowstone, a fully protected, intact, natural ecosystem, free from human hunters, coyotes live in packs with up to seven members. Like a wolf pack, each has an alpha male, alpha female, and pups from previous litters. Old timers here tell me that before wolves were reintroduced, they saw coyotes travel and hunt in such packs. But they say that since the return of wolves, coyotes travel in singles and pair, like the coyote we watched. Keeping a low profile makes sense: forty percent of the deaths of adult coyotes come at the teeth of wolves. But at night when packs reunite, I've heard howling from large choruses filled with many beautiful voices. That howling thrills me and explains why the coyote is called "song dog." When we see or hear a coyote in Yellowstone, we're experiencing an indicator of a healthy ecosystem, a wild place with a social, long-lived, and stable coyote population. 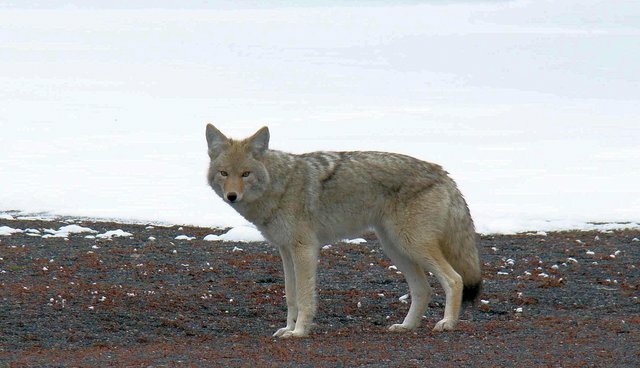 But coyotes share our unhealthy ecosystems, too, and that has corrupted our perspective of the song dog. A coyote living in a metropolis like Los Angeles, for example, will avoid howling for fear of being discovered. It may shun living in a pack in order to keep the lowest possible profile. It will drink from swimming pools and eat anything from garbage to rats to small pets. It may attack a human because it has lost fear of us. Nevertheless, those city dwelling coyotes are intelligent survivors that have adapted to living with humans. But at a price: Unhealthy ecosystems take their toll on song dogs just as they do on humans. The average life span for a coyote is six years, but in a healthy ecosystem like Yellowstone - even with death-dealing competitors like wolves and mountain lions - a coyote can live up to 13 years. I try to keep all this in mind as I watch a coyote feed, or mark its territory on a cottonwood, or raise its head and howl to a mate, or dive nose first into the snow to catch a vole. That animal is doing what coyotes have done for millennia. And those simple acts tell me that both of us are in the healthiest place possible. Rick Lamplugh is a wolf and coyote advocate and author of the bestselling "In the Temple of Wolves." Available as eBook or paperback at http://amzn.to/Jpea9Q. Or as a signed copy from the author at http://bit.ly/1gYghB4.